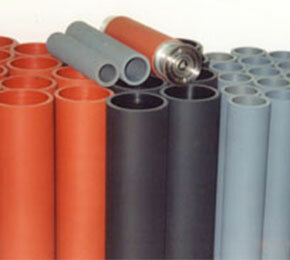 Tint Sleeves, also known as flood coaters, are tint cylinders covered by precision-ground polymeric tubing. This assembly is used to replace the plate and plate cylinder in flexographic presses when a continuous solid coating is required. The sleeves are slid over the tint cylinder using air assist or lubricants to facilitate assembly. Locking collars are placed on both sides of the sleeves to prevent slippage. Tint sleeves are typically used to lay down continuous uniform solid color or overcoat. They are also used to apply primers and adhesives. With the addition of custom grooving, they can be used to apply a continuous stripe. Standard length for tint sleeves is 18″ long and come in a variety of sizes. Many sizes are in stock; special hardness, diameters and length can be manufactured at customer request. Volume discounts are also available. Mid American Rubber offers tint sleeves in EPDM, Buna N, silicone blend, and pure silicone. Available colors include green, black, blue, white, gray (MagnaFlex®), and red (silicone, Buna). Sleeves are stocked in an EPDM compound and our special MagnaFlex®, which was specifically designed for use in coating water, UV, alcohol, ketone- and ester-based inks, coatings, and adhesives. MagnaFlex® is the result of extensive compound evaluation and months of field testing. MagnaFlex® rollers offer truly superior tint sleeve performance. 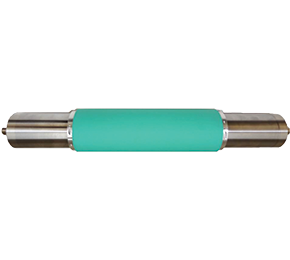 The superior coating uniformity on these rollers reduces, and sometimes eliminates, gear marks and streaks. For additional information, please download our MagnaFlex® 55 (pdf) or give us a call at (800) 723-8190 to start your order today. The new line of MagnaTek™ Digital Print Sleeve is designed to work side by side with Mid American Rubber’s Digital Print Sleeve System. developed to be compatible with UV, oil and water-based inks and coatings. Utilizing proprietary lower-durometer compounds, this model allows for superior transfer and uniformity of coating for digital applications.